We were asked to remodel an existing two-storey penthouse apartment in a city-centre block that suffered from a disconnected entry sequence and a confused, dark interior layout. A rich palette of basalt flooring, glass and walnut define a new stair core, reinventing the apartment as a light, airy, sophisticated urban loft. Unusually free of overlooking issues or privacy concerns, the design makes full use of glazing, giant bi-fold doors and windows to bring daylight into the space, frame views and afford access to large terraces outside. 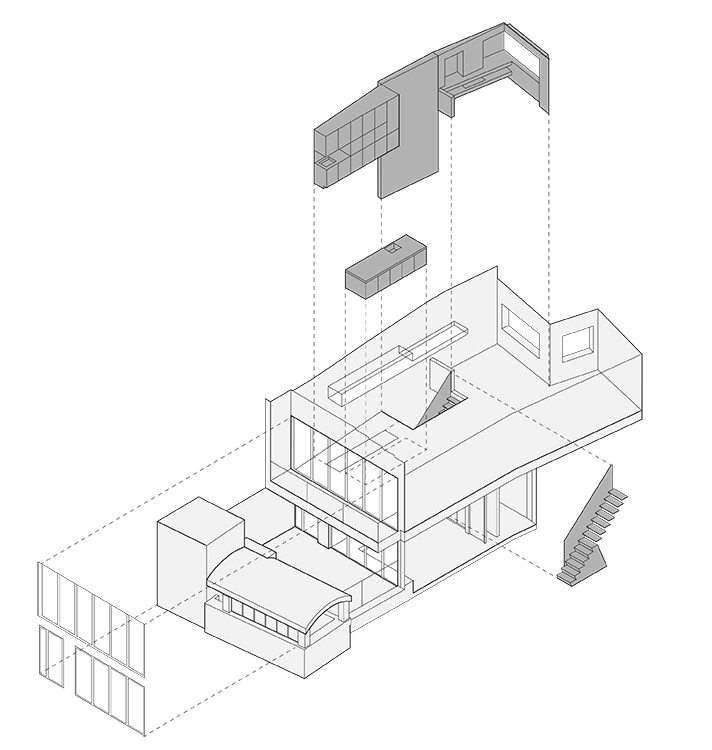 A vertical slice which appears to have been carved through the centre of the apartment provides the focal point of the apartment, as well as offering light and space to the previously dark and cluttered spaces below. The slice is defined by a long rooflight which sits above a glass floored kitchen and open void thorough which an all-glass cantilevered stair rises. The internal staircase has cantilevered glass treads with a glass balustrade that spans from entry floor to the upper floor. This, along with a glass floor kitchen, allows light to permeate the property while also enhancing the sense of space. A large, frameless window opens up views towards St. Giles and Centrepoint, further accentuating the connection with the surrounding urban context. Additionally, full width bi-fold doors are used throughout to offer access to large terrace spaces, uninterrupted views of the city and to enhance the feeling of open-air loft living.